Surprisingly, Poland is still a terra incognita even for many Western art historians. In fact, it is an intriguing destination with architectural wonders spanning ten centuries, from Romanesque to post-war communist planned cities and beyond. 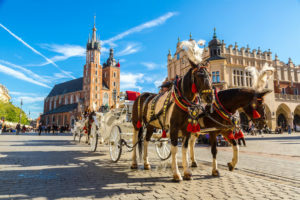 The tour focuses on two cities with the richest cultural heritage in Poland: Cracow, Wrocław and their surrounding regions. In the countryside situated between these two cities we’ll visit a highly ornate timber church laid out like a theater, a baronial residence, a wooden radio tower that played a strange propaganda role during WW2 and Communism, and one of the largest monastic structures in Europe. This tour is a signature project of Dennis McEvoy, art historian and author of best-selling Michelin Guide to Poland. Dennis has been cooperating with StayPoland since 2008 and belongs among our top-ranked tour leaders. Evening: Time to meet with your group leader/guide and for a welcome dinner in the heart of the medieval old town of Krakow. Stroll around the Main Square. Kraków was entered on the first ever UNESCO list for good reasons: it has an almost ideal city plan preserved from the 13C that boasts the largest medieval town square in Europe. The city center is filled with spectacular architecture, from Romanesque to 19th-century eclecticism. In addition, the communists attempted to build a socialist “utopian” city in the 1950s just a few miles outside of Kraków, so modern architecture also tells the story of Poland’s more recent, turbulent past. Kraków is also a vibrant university town that boasts some of the most atmospheric cafes in Europe and best restaurants in Poland. Morning: After breakfast, a walking tour of the old town, including the Old City walls, the Słowacki Theater, St. Mary’s Church, Market Square and Cloth Hall. Gothic university courtyard and the Baroque university church of St. Anne. Break for lunch on own. Afternoon: A visit to the Franciscan church with Art Nouveau stained windows by Wyspiański. Walk to the Wawel hill with its Gothic Cathedral, the burial site of Polish kings, and the Renaissance castle courtyard. 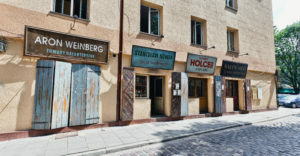 Morning: After breakfast, a tour of Kazimierz, the former Jewish neighborhood, including the one continually active synagogue in Krakow, the Remuh Synagogue plus its cemetery. Then the monumental gothic Corpus Christi church. Lunch on own and free time. Afternoon: drive to Nowa Huta, a neighborhood of Krakow, to visit the center of the Socialist utopian city built from scratch in the 1950s. Enormous steel works and a Renaissance inspired ideal town plan co-exist in what was an experiment in urban and social engineering. We will visit the first church built in this “atheist” experiment that resulted from protests of the local Catholic community in the 1960s against the Communist regime. We will finish with a climb up the legendary Wanda pagan burial mound (approx. 7th century). Evening: dinner at restaurant in Kraków. Afternoon: 11am departure. Drive to Wroclaw. On the way stop at Tyskie Brewery for a tour of the historic brewery and a sampling of their beer. 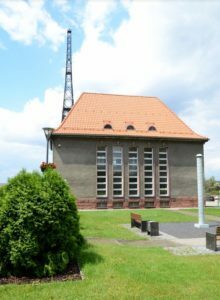 Afterwards a visit of the Gliwice Radio tower where the Germans staged an attack on Aug. 31, 1939 to justify their invasion of Poland the next day.